important for the structure of cell membranes, as precursor for acetylcholine (a neurotransmitter), and many more functions. 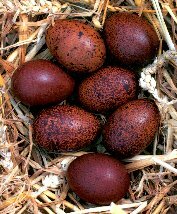 One of the most common dietary sources is eggs (especially the lecithin in the yolks), as pictured above, but is also abundant in many seeds including soy and sunflower. However, it’s important that the soy be sprouted to avoid toxic substances in the seed, and that the soy be non-GMO. 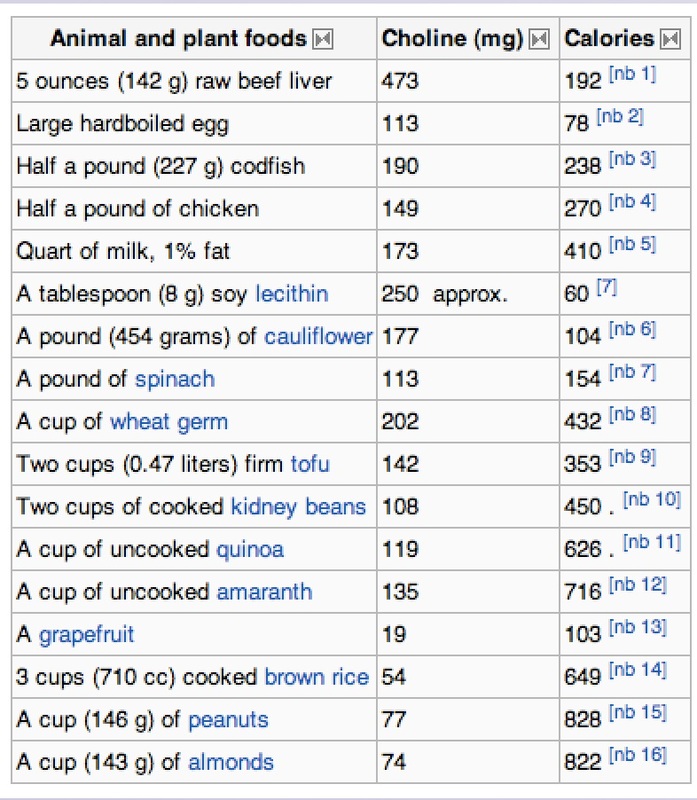 See USDA article (2) for extensive list of choline-containing foods, and amounts; a much smaller version is provided in a chart, below. See also: 1. Diet & Health Menu; 2. One of the liver’s functions is to package up fatty acids (primarily made from excess glucose in the blood) into triglycerides and then into VLDL cholesterol particles for transport in the blood to fat tissue (adipose) for storage. A critical component of VLDL is phosphatidyl choline, which is made in the liver from choline. If there is a deficiency in choline (or its precursor, methionine), the fats remain in the liver as fatty liver deposits (4B), rather than being shipped out in VLDL particles or excreted via bile and digestive waste. One thing is becoming clear to me: excess dietary fat and/or sugar and starch can lead to the production of triglycerides in the liver. If there is sufficient choline and methionine in the diet, those triglycerides are exported from the liver to the adipose tissue. If there is insufficient choline and methionine, the triglycerides remain in the liver and can lead to dangerous inflammation of the liver, if there is also excess dietary polyunsaturated fats (PUFA), especially Omega-6 PUFA such as that from corn and soy oils (4C). So in addition to needing sufficient choline and methionine, we also need to minimize excess carbs and polyunsaturated oils such as corn, soy and canola if we want to minimize stored fat (both in adipose and in liver tissue). That is, unless the excess fatty acids are excreted with bile in the stool, rather than conversion to triglycerides. FDA recommendations (AI) for daily dietary choline are: 425 mg for women, and 550 mg for men. But many believe these recommendations are too low. The tolerable upper limit of daily choline intake is 3500 mg. Amounts in excess of this can result in runny stool, low blood pressure, and fishy body odor. (Source “9” is lost). According to Chris Masterjohn (4A), one of the reasons it is difficult to pin down the minimum daily requirement of choline is because that minimum depends on the dietary intake of certain other nutrients involved in the methylation cycle (part of the liver’s detox and protein synthesis pathways); namely folate, B12, B6 and betaine intake. Chris Masterjohn’s Choline Database (new 4/17/19) (4D); includes instructions on how to use the database. By far, the richest source of choline is organ meets (liver, heart, etc.). The most common supplemental form of choline is as a component of soy lecithin, but I prefer sunflower lecithin because sunflower seeds are not as toxic as soy, and have not yet been altered by GMO. It is well known that raw, whole milk contains more choline than heat-treated milk such as pasteurized milk with 1% fat listed in chart above: 173 mg choline in 1 quart (equates to 43 mg in an 8-oz glass). But I’ve not been able to find out just how much more, primarily because our government frowns on the consumption of raw milk for “sanitary” reasons. Pasteurized whole (3.25% fat) milk contains 14.2 mg per 100 gram (3.5 oz) serving (2); this is equivalent to 32 mg choline in 1 cup of whole pasteurized milk. According to 1944 data from Pet Milk company (5), “fresh” milk provides 131-169 mg choline per liter of milk. This is equivalent to 31 – 40 mg choline per cup of fresh milk. (“Fresh” is the old term for “raw” milk). Salted butter contains 18.8 mg choline per 100 grams (2), which equates to 5.3 mg choline per ounce or 2.7 mg choline per Tablespoon salted butter. This entry was posted in Health and tagged butter, choline, lecithin. Bookmark the permalink.